Ricketts said his proposed two-year budget would hold spending growth to 3.1 percent. While state agency spending has been kept low, he said, a slight overall increase was necessary. “A significant portion of this spending increase is attributable to Medicaid expansion and state aid to public schools,” Ricketts said. The governor’s budget proposal includes a record $1.1 billion in K-12 education spending. Ricketts also outlined property tax relief efforts, which he said was Nebraskans’ top priority. The governor’s budget would add $51 million to the state’s Property Tax Credit Relief Fund. In addition, he encouraged lawmakers to back proposals to establish a $275 million minimum balance in the Property Tax Credit Relief Fund and impose a three-percent cap on property taxes levied by municipalities. “Over the past decade, local property taxes have risen over 57 percent. To deliver long-term, structural relief, it is important that we limit the growth of property taxes,” Ricketts said. Ricketts added that any proposal to reduce property taxes should not be offset by increases in other taxes. 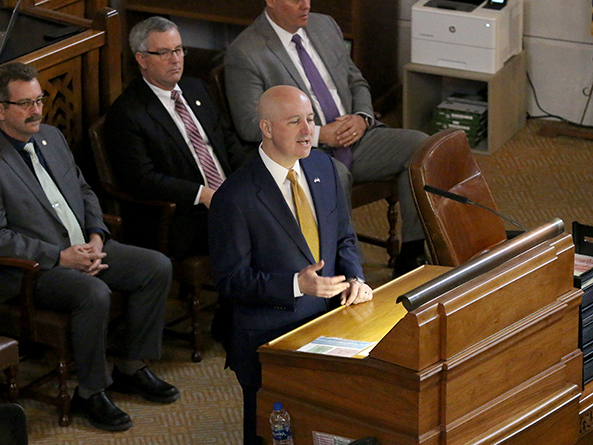 The governor touted Nebraska’s low unemployment and rising wages, and pledged to continue economic growth by focusing on workforce development. He proposed creating an additional 2,100 college scholarships, geared toward students studying in high-demand fields, and adding $1.25 million to the Developing Youth Talent Initiative. That program enables middle school students to learn about the fields of manufacturing and information technology. “This program has already impacted students, and this expansion will help reach even more,” Ricketts said. Prison expansion also was included in the governor’s budget proposal. The state must reduce its overcrowded prison system to 140 percent of design capacity by July 1, 2020, and Ricketts proposed adding space for 384 more high-security beds to address that mandate. “Let’s roll up our sleeves to connect Nebraskans to great jobs, to control spending, to make government more effective, to deliver tax relief for our veterans and to cut property taxes,” Ricketts said.